at the 2014 Lindau Nobel Laureate Meetings. 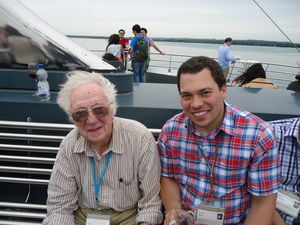 This past June at the 64th Lindau Nobel Laureate Meeting, 37 Nobel Laureates met 600 young scientists from around the world to share their knowledge, establish new contacts, and discuss such topics as global health, the latest findings in cancer or AIDS research, challenges in immunology, and future research approaches to medicine. Chemistry and biochemistry graduate student Douglas Rice was one of that select group. Rice is advised by Bradley Smith. 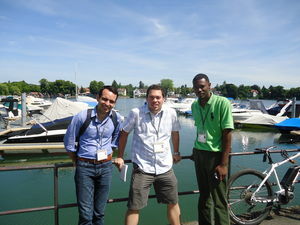 Established in 1951, the guiding principle of the Lindau meetings is, “Educate. Inspire. Connect.” The meetings rotate between disciplines — this year, the theme of the June meeting was physiology and medicine. Morning lectures by the Laureates were paired with informal afternoon and evening sessions that offered a unique opportunity for individual and small-group interactions. "I feel incredibly fortunate to have attended the 64th Lindau meetings, which brought together Nobel Laureates and young researchers from 80 countries in a beautiful island town in southern Bavaria." Rice with fellow delegates in Bavaria. "After four days of inspiring lectures and stimulating conversations, I can say with certainty that it was a defining week of my life. It was an unbelievable opportunity to learn from Nobel Laureates and to discuss their path to greatness. There is nothing more inspirational than a Nobel laureate: a person who has pushed back the boundaries of what we know through hard work, critical thinking, and perseverance." "Additionally, long after the details of the Nobel Prize talks will leave my mind, the connections I made with my peers will remain. This meeting presented an unparalleled opportunity to connect with the best and brightest medical scientists. I developed contacts with researchers and physicians from around the world — and I plan to stay connected with them throughout my career." "My admission to the meeting reflects well on the quality of my graduate education. I have never felt more proud to be a member of the Notre Dame community." In August, Notre Dame Economics graduate students Robert Lester (advised by Prof. Michael Pries) and Kevin Rinz will attend the Lindau Nobel Laureate meetings on Economics. In September, Renator Bettoil, Mathematics will attend the parallel Heidelbert Laureate Forum. Several Notre Dame graduate students have been selected to attend the prestigious Lindau meetings the past three years: James Clancy, biology, in 2011; Catherine Rastovski, physics, in 2012; and Brandon Haines, Matthew McDonald, Erin Wilson, and Matthew Wilson, all chemistry and biochemistry, in 2013. Originally published by Mary Hendriksen at graduateschool.nd.edu on July 24, 2014.